A fun and elegant way to let someone know you support their life's journey. A loving gift to yourself for encouragement and enjoyment, too. They can also be framed to keep in your office, near your bed or altar, and the pears are great in the kitchen, too! The images on these cards are from photos taken by Joette Tizzone and digitally enhanced. 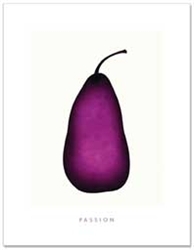 The playfulness and sweetness of the pear images inspired and reminded her of qualities she wanted to keep in the forefront of her consciousness. Printed in the USA, using recycled papers. Box is made in the USA with recycled papers.